Hardy, G. H. 《一个数学家的辩白》. 北京: 北京大学出版社. 2004: 83 . ISBN 978-0-521-42706-7. ^ Irvine, Andrew D. Principia Mathematica (Stanford Encyclopedia of Philosophy). Metaphysics Research Lab, CSLI, Stanford University. 1 May 2003 [5 August 2009]. ^ The Modern Library's Top 100 Nonfiction Books of the Century. The New York Times Company. 30 April 1999 [5 August 2009]. ^ Quote from Kleene 1952:45. See discussion LOGICISM at pages 43–46. The first edition was reprinted in 2009 by Merchant Books, ISBN 978-1-60386-182-3, ISBN 978-1-60386-183-0, ISBN 978-1-60386-184-7. Stephen Kleene 1952 Introduction to Meta-Mathematics, 6th Reprint, North-Holland Publishing Company, Amsterdam NY, ISBN 0-7204-2103-9. Stephen Cole Kleene; Michael Beeson. Introduction to Metamathematics Paperback. Ishi Press. March 2009. ISBN 978-0-923891-57-2. Ivor Grattan-Guinness (2000) The Search for Mathematical Roots 1870–1940, Princeton University Press, Princeton N.J., ISBN 0-691-05857-1 (alk. paper). Tractatus Logico-Philosophicus (Vienna 1918, original publication in German). Michel Weber and Will Desmond (eds.). Handbook of Whiteheadian Process Thought, Frankfurt / Lancaster, Ontos Verlag, Process Thought X1 & X2, 2008. 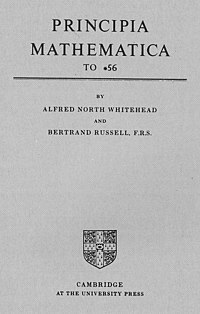 Principia Mathematica—by A. D. Irvine. The Notation in Principia Mathematica—by Bernard Linsky.